When working on projects with limited audio space, such as apps for mobile, browser-based games or packaged electronics/toys, it is often necessary to squeeze as much out of that space as possible in order to meet or exceed the expectations of the project. 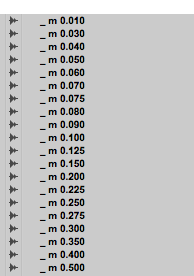 From the standpoint of the sound designer, this is likely achieved through compressing the sound files in various ways. However, when working with linear audio that contains gaps of silence or recalls repeated audio, precious space can be saved by editing within your Pro Tools session and exporting the resultant files and session data for programming. While the processes for identifying and editing these two elements are different, their functionality in implementation is essentially the same. In Part 1, I cover the process for getting started, staying organized, and identifying and removing silent gaps. 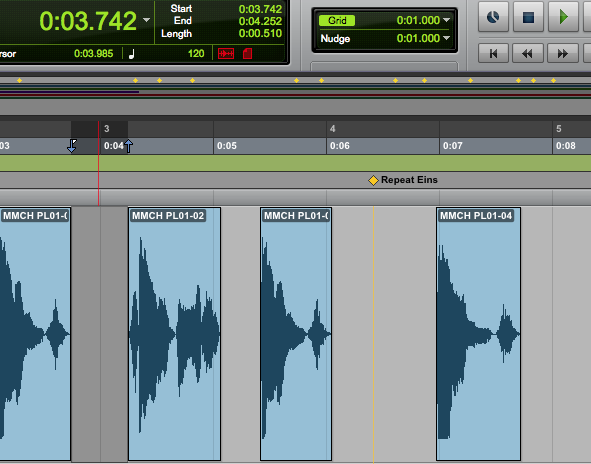 Since there was not enough space to accommodate that amount of audio, it was imperative that I find a way to cut down. The middle series of files appear to be separate, but they are all part of the same line of text. With the help of the Playlist Dividers, the line “Drei. / Zähl bis / drei. / Eins. / Zwei. / Drei. / Super!” stands apart from the others that precede and succeed it. When it comes time to export the session, this organization will be key in formatting the information, which will be addressed later in this tutorial. Side Note: While going through this editing process, I recommend staying in “SHUFFLE” mode to retain the integrity of the space when removing and replacing silent gaps. Like the Playlist Divider, the “_” at the beginning of the filename is used to keep the Mutes at the top of the REGIONS file list for easy access. If you want more control over editing individual sound files, select Pro Tools’ “Selector Tool.” You can then manually highlight and cut the silence and then replace it with Mutes. For instances where more than 500 milliseconds of silence was removed, I stacked the Mutes contiguously to make up for the extra space (e.g. 500ms + 125ms). Accommodating for every instance of silence is time-consuming, so I find it easier to start with a basic palette of Mutes and build as needed. This concludes Part 1. In Part 2, I continue looking for opportunities to save space by reusing audio clips in multiple places. Should you have any questions, please contact me via the social media links below or feel free to email me directly, george@creatingsound.com. Thanks for reading! Interesting post–I can’t wait to see the other 2 parts! Because I am a workflow nut (and have done a lot of foreign language program editing), one thing did jump to mind. Instead of creating dummy mute files with specified times then slotting those into approximate gaps, why not just delete the audio, consolidate the blank space, then rename the ‘mute’ region with your _m naming convention? The whole process can be automated with Quickeys (mac) or AHK (pc). Assuming you are manually selecting the gap you could: cut the region, shift+opt+3 to create new ‘mute’ region of silence, numpad = 3x to select region length, cmd+c to copy that value, then cmd+shift+r to rename the region using your naming convention and pasting in the region’s length. Now you have a mute region named with its respective length. I know that looks like a lot of work, but the whole process after making the selection can be automated and executed with one keystroke. That way, you can quickly replace all silences with your mute regions. If you the strip silence method, you could do the same thing. Just find the empty spots in the playlist, select them, then execute the macro from there. I realize taking the time to create the macro might only make sense if there is a lot of audio to get through, but it could save some of the boring busy work. Thanks for reading and for the positive reply! My colleagues use Quickeys (mac) for a lot of their renaming, especially before export, but we haven’t done it yet for Mutes. This might be an interesting approach for especially large projects, as you mentioned. The majority of my smaller projects have limited audio to begin with and I’m assuming that your approach will work on the back end when it comes time to export the session data. I’d love to hear your thoughts once parts 2 and 3 are posted regarding your suggestions and how this might be improved with additional automation.